There is another famous experiment that I would like to talk you through. I will try with lots of schematic drawings. The pay off is that it is another look at how the quantum world is beyond our day-to-day experience and how our basic notions are projections. For now, that is plenty! We can go deeper later. We are going to look at what happens when a light goes through an interferometer. Lets look at the basic set up, a “big picture” look.It is all there, but we will have to go over it step by step. First, what is in the diagram?. There is a light source, here the green lamp in the lower left corner of the diagram. 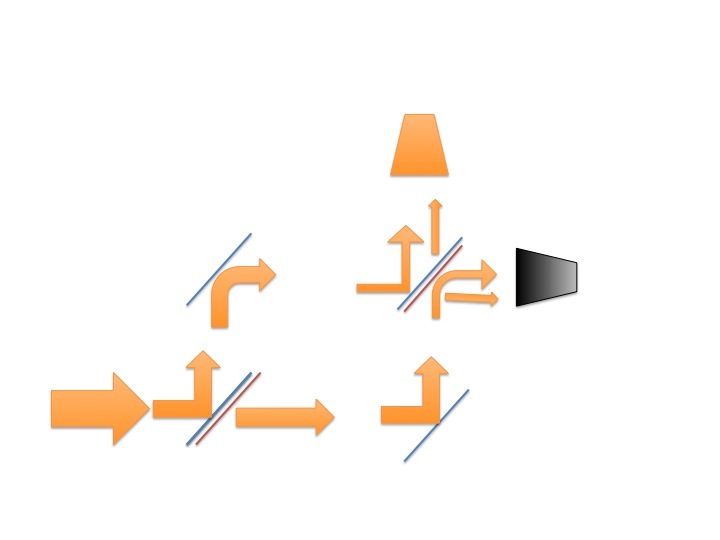 The yellow arrows indicate the path the light takes. There are four mirrors, one at each corner, all indicated by diagonal lines. Two mirrors, one at the upper left corner and the other at the lower right corner, are indicated by a single blue line. They are full-silvered mirrors and they reflect all the light that comes to them. Two other mirrors, one at the lower left corner and the other at the upper right corner, are half-silvered mirrors. These reflect half of the light that comes to them, and let half of the light through. A very important point is that the half-silvered mirrors have a front and a back. The back, here indicated by a red line, also reflects half the light and lets half the light through, but there is a change in the reflected light when reflected off the back ( red) side of the half-silvered mirror. The “phase” of the light is shifted. We will get back to that in a bit; it makes all the difference. The black trapezoid objects in the upper right par of the diagram are light detectors. That is, they will register the light that gets to them (and their color will turn from black to yellow here in these diagrams). This next diagram shows another overview showing what will happen. We send light through the interferometer and only the top light detector registers light. Why is that? What happened to the light going toward the lower right detector? Here we see the light that came from our lamp at the lower left in our first “big picture” diagram. This light first interacts with the lower left half-silvered mirror. 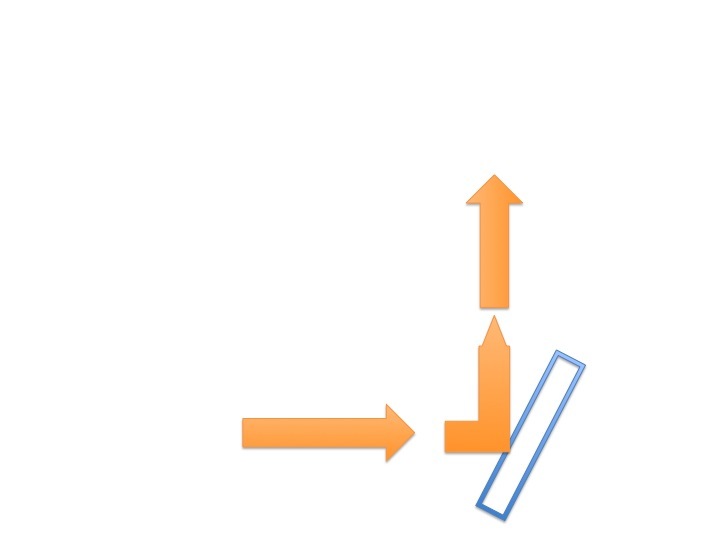 Half of the light is reflected, and because of the mirror’s angle the reflected light is sent up in this diagram. The other half of the light goes straight through along the bottom left to right. This is why there is a half-silvered mirror here at the beginning of our interferometer device, to split the light into two pants, an upper and lower path. The half of the light that was reflected straight up along the upper path at the first mirror now reaches the upper left full-silvered mirror and all of that light is reflected, now going along the top from left to right. 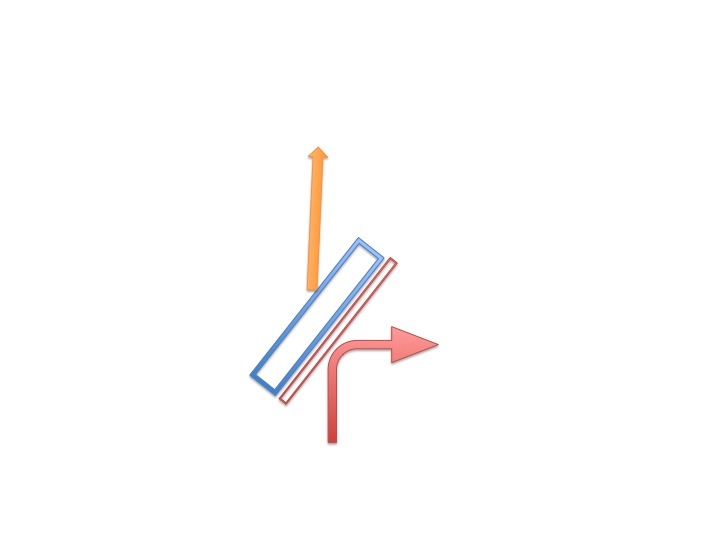 The half of the light going left to right on the lower path that went through the first half-silvered mirror next reaches the lower right full-silvered mirror and is reflected up along the right side of our interferometer. The light in the upper path going from left to right reaches the upper right corner half-silvered mirror. This light from the upper path is again split at the half-silvered mirror at the upper right just like the light was at the first half-silvered mirror at the lower left corner of the interferometer. At this last mirror once again half of the upper path light goes through unchanged, and half is reflected up to the top light detector. Now here is where it gets a bit tricky. The light from the lower path next reaches this last half-silvered mirror in the upper right corner of the interferometer. But this time it interacts with the back of the half-silvered mirror! This light from the lower path is also split at the half-silvered mirror. The half of the lower path light that goes straight through the half-silvered mirror continues up to the upper detector unchanged. That light transmitted from the lower path gets to the upper detector at the same time as the light from the upper path that was reflected up to the detector, so the light reflected from the upper path and the light that goes through from the bottom path combine and the upper detector registers the light. BUT the light that was reflected off of the BACK of the upper right half-silvered mirror from the lower path is now shifted 180 degrees out of phase by the back of the half silvered mirror! 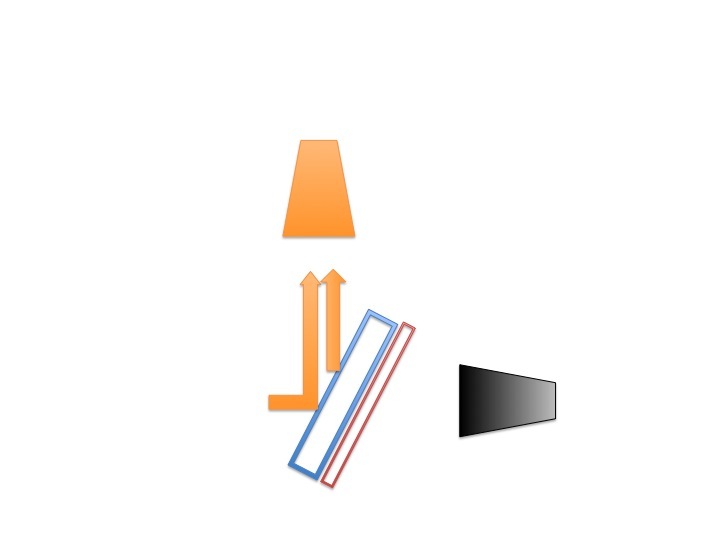 This means the peaks of this light, the “out of phase” light reflected off of the back of the half-silvered mirror, now in red in the diagram (but don’t get confused, that color change is just to make it easy to follow; the light doesn’t change wavelength or color) lines up with the troughs of the light that went through from the upper pathway. So the two light waves, the wave of light that went through the last mirror from the upper path and the wave of light reflected form the back of the mirror from the lower path “cancel” each other out. They completely “interfere” with each other (negative interference in the jargon). Hence the name of the device: interferometer! The peaks, like we have seen in previous posts and in the diagram to the right here, we can think of as +1, the troughs as -1. So you can see how the +1 peak lines up with the -1 trough, and that kind of alignment of the same + with – holds true throughout the whole wave. So the +’s combine exactly with the -‘s and cancel each other out (+1 and -1 =0). So NO light gets to the lower right detector, which remains black in our diagram. When only the upper detector detects light, the lower right detector detects nothing, we know that both paths are open and the light went through both the upper and lower path. Now for a really amazing result: if we send one photon at a time through, once again only the upper detector registers light! The indivisible, basic particle, the photon say (but other particles and even small molecules have been shown to do this), the discrete energy carrier of electromagnetic waves, is in both pathways. But it can’t be, a photon, a particle, is a most basic thing, it is not divisible, of course.Right? Well, yes, but no. 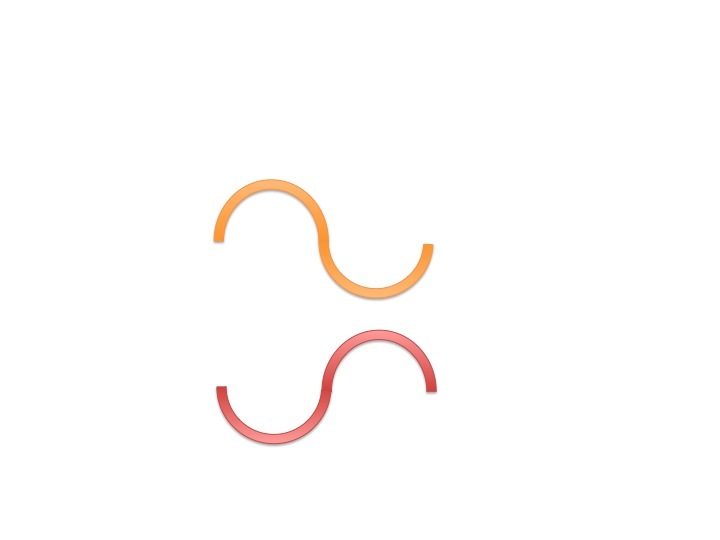 This situation where the photon interferes with itself when both paths are open is called “superposition.” It almost seems as if the photon is “in” the two paths at once in superposition. This is a mathematical idea, of course. Superposition is a word for a phenomenon that can be mathematically described but has no four-dimensional meaning in any sense we can picture or comprehend based on our day-to-day experience and our monkey brain. 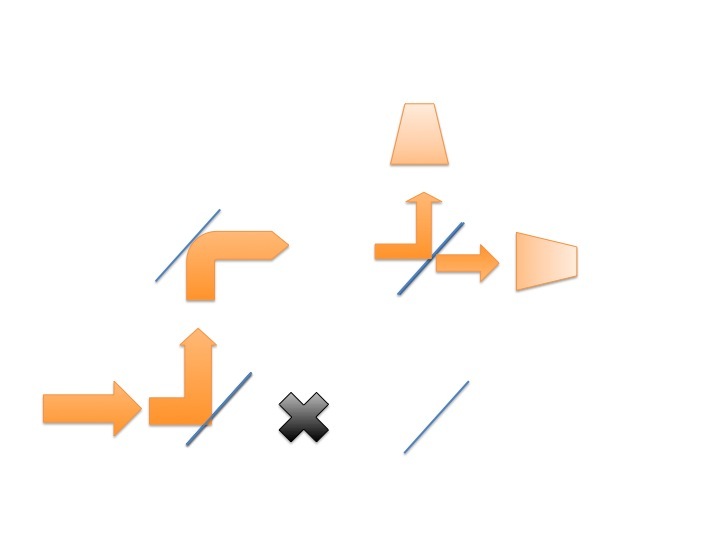 The particle is, in effect, going through all possibilities of all of the paths, every one however unlikely (in this “simple” case both paths are equally likely). Though of course that is impossible in ordinary time and space. Now, if you block a pathway, then both detectors detect light! 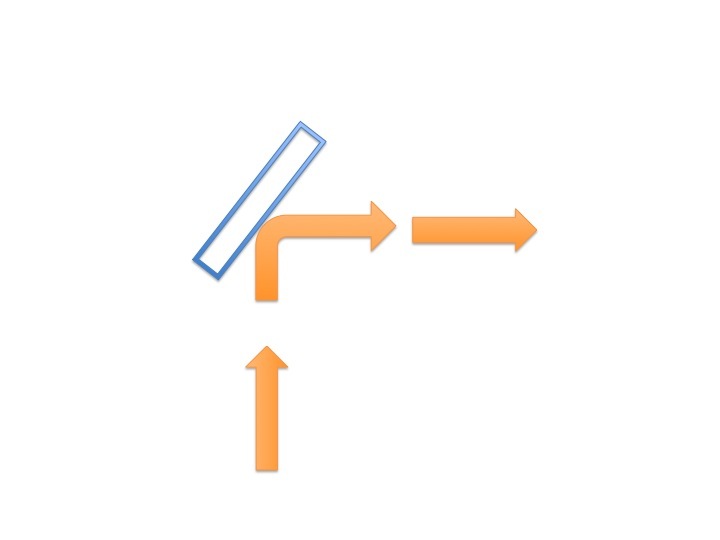 If you send a beam of light through just one path (either upper or lower;in the diagram below it is the upper path) both detectors register light. 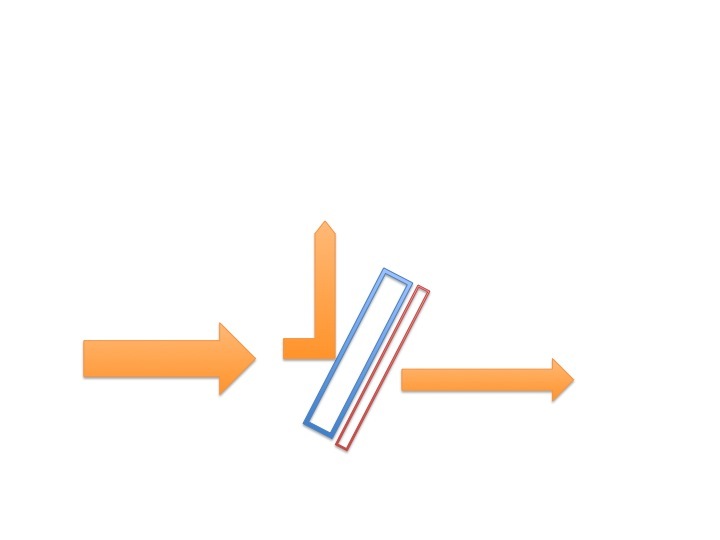 If you send one photon at a time through only one path of the interferometer then only one of the two detectors will register each photon that goes through, but over many runs with single photons half the time the upper detector will register the photon, half the time the detector on the right will register the photon! 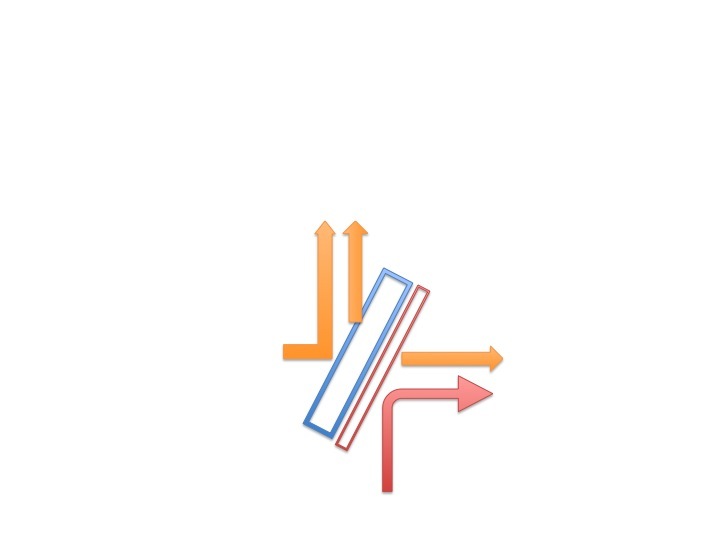 To see what is happening, in this diagram the upper pathway is open, the lower blocked. 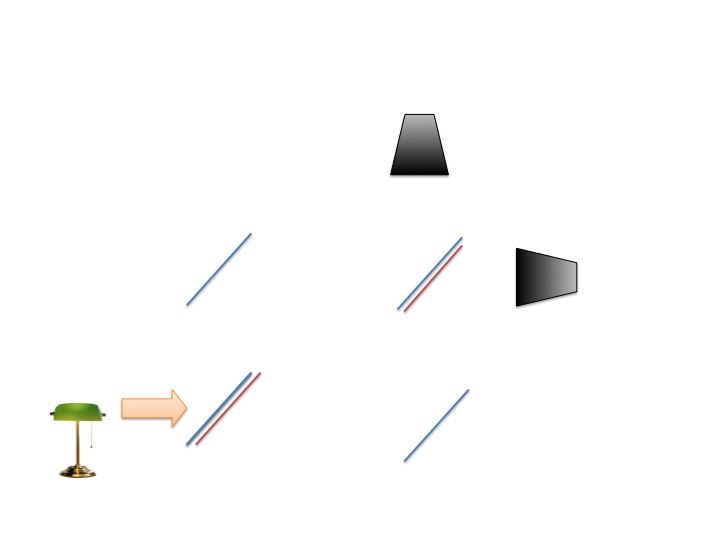 At the upper right half-silvered mirror half of the light (or half of the photons over different run when one photon at a time is sent into the interferometer) goes through the mirror to the detector on the right, half at the light (or half the photons over different runs) is reflected up to the upper detector. The situation is the same if the upper pathway is blocked. The light reflecting off the back of the upper right half-silvered mirror is indeed phase shifted as before, but there is no other light wave from the upper path going through the half-silvered mirror to “interfere” with the out of phase light (the detector doesn’t care about the phase), so there is no “negative interference,” No two waves to cancel each other out! So if both detectors light up when a beam of light is sent through, or over many runs with individual photons, you know that only one pathway is open! This shows that indeed photons can act as discrete particles that can be detected one at a time. As before with the double slit experiment though we have to ask, how do they “know” to go half the time to one or the other mirror if they are separated in space and time? Here is the kicker. If you don’t block either pathway, but set up some sort of detector that will tell you which path the photon is on, even if you can show it doesn’t mess with the photon in any way you can tell, it is just as if the other pathway is blocked. The superposition disappears! Both detectors will register light (again, when sending only a photon through at a time they won’t both detect the photon at the same time, one or another will do so, but over many runs it will be half and half again!). Lets stop here. This is one of the big deals in quantum mechanics. Why does “knowing,” that is detecting the photon on one path or another make a difference? What does knowing or detecting mean? And didn’t we already show the photon is in this weird superposition as if it is in both paths at once? I told you not to get hung up on how you are picturing this. It won’t work. Special thanks to Prof. Benjamin Schumacher whose Great Courses lectures on quantum mechanics are very good and who presented this version of the interferometer.